So surfing the web I came across an ad for a peavey bass cab.... when I read the ad in the fine print it says "amp on top doesnt work make me an offer" long story short I meet the guy asap in a Walmart parking lot handed him $100 Canadian and took my new project home. -Borrowed a friends tester and all tubes showed bad, so I have a new set on order. --Next the caps need to be redone... look like a mix of old and new... do people suggest replacing the large "cap can" If it appears to be in good shape? any suggestions would be helpful on what caps I should get. -power tube sockets seem like they might have small crack? I'm guessing they should be replaced? I had a buddy redo the cab and its turning out great so any advice on getting the amp up and running would be awesome. Im not an expert but it's not my first time working inside an amp but this is my first with a sunn! Later versions of the amp have one or two 20uF 600V axial caps as the first two filter caps. They are usually mounted near the Standby switch. Does your amp have these? Can you post a picture? I thought those types of deals on old Sunn; old tube amps in general really, were just a memory. Kudos on a great score! I haven't come across a SS rectified 2000S schematic, as far as I know they are the same except for the rectifier. As Loudthud points out they added the supplemental big 600V electrolytics, and anomalies from amp to amp are fairly common in old Sunns as with many mass produced hand wired amps from the era. Add to that the possibility of many different "techs" digging around in there over the past five decades, etc. As mentioned earlier, they are pretty straightforward and basic. I'm certain you will get her up and sounding outstanding! I cant see your gallery pics. I upload pics to photobucket and then copy and paste the IMG link into the body of the post, as with the one in this post. anyone able to help on dating this beast as well? this looks awesome adding to the shopping list! EdBass's advice is spot on. With today's wall voltages, the original can cap is over voltage and should be replaced with higher voltage caps. Can caps are expensive and only come in limited values these days. The one available for the Sunn applications doesn't have a high enough voltage rating for today's voltages, plus it is cheaper to use the alternatives mentioned by Ed and myself. You can use discrete caps inside the chassis connected to terminal strips, and preferably connected in series to get a high enough voltage rating, but you can also just use the board he linked from Triode Electronics. They already have the series connected caps on it and have good quality caps on the board....its pretty much a plug and play. You just leave the can cap in place for cosmetic reasons, but disconnect it electrically. All the other electrolytic caps in the amp should be replaced too. You would also want to verify the plate and screen grid resistors on the power tubes and preamp tubes are within spec. Those often drift out of spec and/or get noisy. Some of the coupling caps may have developed DC leakage over the years, and you can check these one at a time for leakage if you want to. The Black Cat caps tend to leak DC after this much time since new. The brown blob caps tend to work fine after all these years but they aren't very good quality and some modern replacements will likely sound better. Orange Drop polyester 6PS series come to mind, as do Mallory 150M caps. The power supply dropping resistors can also be checked for drifted values and replaced if necessary. Replacing these with metal oxide resistors would be a good choice as they won't drift value and they are non-flammable unlike the current ones in there. The "death" cap in the power supply should be disconnected and the power supply rewired correctly. The "death" cap in your pictures is the one that is connected to the ground switch. It looks like someone installed an IEC plug with a 3 wire ground, so just make sure it is wired correctly. You might also consider replacing the power tube sockets if they are badly cracked or look like they have arced. New replacements aren't very expensive. I like Belton sockets myself, although modern ceramic replacements are cheap cost-wise too. The main thing with those aside from quality would be to find new sockets that have the same hole size. In your pictures the sockets don't look that bad, but perhaps they just need to be cleaned with DeOxit. It looks like quite a few parts burned or smoked near the power tubes and got that area of the chassis black. There are also some non-stock wiring and parts around those sockets too. Later when I get home I can see if I can post a picture of a stock 2000S for you. Since that amp doesn't have the sockets for the tube rectifiers and was solid state rectified from the beginning, then I would say it is likely from perhaps 1970-1971. What do you think about a date Ed and Loudthud? I would say that you would probably not need to replace those extra caps....just take them out of the circuit and use the SDS Labs board from Triode Electronics and wire up appropriately. The original tube rectified version of the 2000S had a 30uF-20uF-20uF-40uF(two 20uF in parallel) setup. The SDS Labs board has 100uF caps in series for 50uF for each section. You should be able to revert to this circuit instead of using the extra caps added as you describe. The SDS Labs design would give you some increased capacitance in the preamp and phase inverter and screen sections. The preamp and phase inverter sections are RC coupled, so the larger cap size here will change the tone a bit...allowing for more bass out of those stages, but it shouldn't be a huge effect. Those sections will also be quieter as far as hum level is concerned. Perhaps Ed could share how the tone changed when he put the SDS Labs board in his amp? If you haven't ordered the board yet, you could always order just the board, and get the caps separately in order to pick the sizes of caps you would prefer. You could go larger than the 50uF (two 100uF in series) they use if you wanted, for a quicker and tighter bass reproduction. If you wanted to duplicate the original circuit that you had with those added caps, you would need to use two series connected 40uF 450V caps (or thereabouts) and also have a 220k 1W resistor in parallel with each cap (in order to share the voltage and current). I'm guessing the two 40uF that they had connected in the circuit you describe were parallel, but they could also have been series connected. The type of connection here would determine what you needed to replace with as two parallel connected 40uF caps would be the same as one 80uF 450V cap, and series connected would be the same as a 20uF 900V cap. As far as suppliers go, Mouser (www.mouser.com) and Digikey (www.digikey.com) are good and ship quickly to Canada. Another choice could be Antique Electronics (www.tubesandmore.com). Mouser of Digikey would be a better choice for Panasonic radial caps to fit in that board if you decided to pick the parts yourself, and Antique Electronics is a good choice for many other tube amp specific parts. PS- thanks Soundmasterg, EdBass and loudthud for your knowledge and help! Since that amp doesn't have the sockets for the tube rectifiers and was solid state rectified from the beginning, then I would say it is likely from perhaps 1970-1971. What do you think about a date Ed and Loudthud? My 2000S with the SDS board has a 4/72 (350B era) inspection date, but is labelled as a 2000S. Perhaps Ed could share how the tone changed when he put the SDS Labs board in his amp? It picked up some power and the bottom end tightened up a little, more definition. Overall the amp got a little more "punch". Still very much a 2000S, didn't change the overall tone really, at the time my initial thought was "that's probably closer to how it sounded fresh out of the factory with brand new everything". That was my primary reason for going with the SDS board also. That amp was going to become my primary gig amp for several years, which it did. Still strong, I don't use it much anymore. I've been spoiled by being in a band with a dedicated PA and crew for the past few years, all I need is a 200S, I-40 cab and a Heil PR40 to get my signal to the console. REAL easy load in/load out for this old man. Yes I think you have it. I'm not sure why they had those added caps in the first place. Did they also add extra resistors or chokes in between the caps? If so then that is another filtering stage and would result in a decrease in hum and noise and a cleaner signal to the preamp supply. If they didn't add those however, then those caps are essentially in parallel with the first cap in the can. Just make sure if you go with the SDS Labs board that you rewire the rest of the amp appropriately to reflect the schematic that is available. 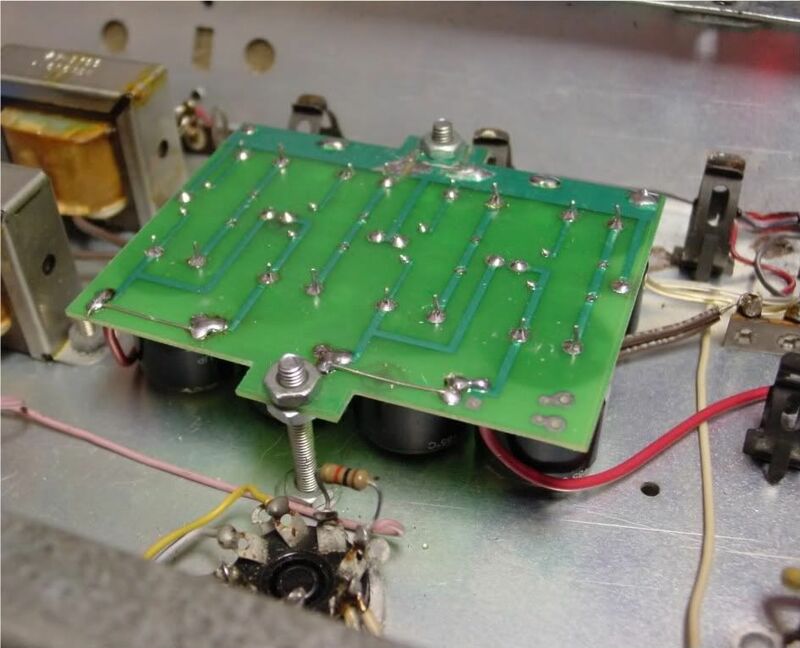 Also in addition to the bias caps, you would have a 250uF 15V cathode cap on the first stage (might not be there, I've seen amps both ways), and a 22uF cathode cap on the second preamp stage, You should also verify the NFB resistor values and replace if necessary as they tend to drift. Also check the NFB cap as that ceramic cap also tends to drift or go bad. Thanks for sharing Ed! I can't make any sense of that date code stamp either.